1College of Medicine and Health Sciences, Sultan Qaboos University, Muscat, Sultanate of Oman. 2Department of Biochemistry, College of Medicine & Health Sciences, Sultan Qaboos University P.O. Box-35, Postal Code 123, Muscat, Sultanate of Oman. *Address correspondence and reprints request to: Riad Bayoumi, Department of Biochemistry, College of Medicine & Health Sciences, Sultan Qaboos University P.O. Box-35, Postal Code 123, Muscat, Sultanate of Oman. Al-Sinani A, Al-Shafaee M, Al-Mamari A, Woodhouse N, Al-Shafie O, Hassan M, et al. Familial Clustering of Type 2 Diabetes among Omanis. Oman Med J 2014 Jan; 29(1):51-54. Objective: The aim of this study was to screen Omani individuals for the familial aggregation of type 2 diabetes mellitus. Methods: A random cohort of 1182 Omani individuals visiting the Family Medicine Clinic at Sultan Qaboos University Hospital (SQUH), Muscat, Oman, for regular medical checkup, aged ≥40 years, were sampled. Patients were categorized into three groups: (1) individuals who claim not to have diabetes and had no family history of diabetes; (2) individuals who claim not to have diabetes but had family history of diabetes; (3) individuals with diabetes. Only 16% of these Omani individuals had no diabetes and no family history of diabetes. Another separate random cohort of 234 Omani type 2 diabetes mellitus patients, from the Diabetes Clinic at SQUH, were interviewed and questioned about their family history of type 2 diabetes mellitus. Results: Ninety five percent of the patients had a family history of diabetes. Eighty percent had first degree relatives with diabetes and 46% had second degree relatives with diabetes. At least one parent with diabetes was reported among 55% of these diabetics, while maternal diabetes (55%) was found to be higher than paternal diabetes (47%). However, only 15% had both parents with diabetes. Furthermore, almost half of the 234 diabetics were having at least one of the following relatives with diabetes: brother, sister, aunt or an uncle. Conclusion: The findings of this study confirm familial aggregation of diabetes among the Omani population. Compared to other populations, familial aggregation of type 2 diabetes mellitus among Omanis is relatively very high, and is perhaps due to the very high degree of consanguinity among Omanis. Since almost everyone seems to have a genetic predisposition to diabetes, the dramatic lifestyle changes over the past 25 years, could tip the population into an epidemic of type 2 diabetes mellitus. Keywords: Type 2 diabetes mellitus; Family clustering; Oman. Type 2 diabetes mellitus (T2D) is the predominant form of diabetes and accounts for at least 90% of cases. The estimated worldwide prevalence of diabetes among adults was 6.4% in 2010 and is predicted to rise to about 7.7% by 2030.1 The rise in prevalence is predicted to be much more in developing than in developed countries. This form of diabetes is most often associated with older age, obesity, family history, previous history of gestational diabetes, physical inactivity and certain ethnicities. A family history (FH) confers an up to 3-fold increased risk for first degree relatives to develop the disease.2-4 The risk of developing T2D is 40% for individuals who have one parent with T2D and about 70% if both parents are affected.5,6 In addition, concordance rate for diabetes is generally higher in monozygotic twins (70%) compared with dizygotic twins (20-30%).6,7 Previous studies have reported higher prevalence of T2D among mothers of probands with T2D than among fathers and the excess maternal transmission of T2D was reported in different studies.8-16 However, other studies reported no difference in parental transmission of T2D.17-21 Large differences in prevalence of T2D between different ethnic groups exist and seem to depend on heritability, consanguineous marriages and environmental factors. According to the IDF diabetes Atlas, fifth edition, six out of the world's top ten countries for prevalence (%) of diabetes (20-79 years) in 2011, are in the Middle East and North Africa region; Kuwait (21.1%), Lebanon (20.2%), Qatar (20.2%), Saudi Arabia (20.0%), Bahrain (19.9%) and United Arab Emirates (19.2%).22 The prevalence of diabetes in Oman in 2011, was estimated to be 10.8%; with a further 9.7% of the population at high risk of diabetes with impaired glucose tolerance (IGT).22 Consanguineous marriages in Oman are about half that of all marriages,23,24 and there is strong evidence that genetic factors play an important role in the pathogenesis of T2D.25 Investigating the family clustering of T2D among populations can help towards quantifying the genetic component and assessing the impact of other environmental factors. This study screened a sample of the Omani population for FH of T2D and investigated the familial aggregation of the disease among Omani individuals with T2D. This hospital based cross-sectional study was comprised of a random cohort of 1182 Omani individuals visiting the Family Medicine Clinic at Sultan Qaboos University Hospital (SQUH), Muscat, Oman, for regular medical checkup, aged ≥40 years, who were sampled from July 2010 to July 2011. Individuals were screened for FH of diabetes and categorized into three groups: (1) individuals who claimed not to have diabetes and had no FH of diabetes; (2) individuals who claimed not to have diabetes but had FH of diabetes; (3) individuals with diabetes. Another case series study with a separate random cohort of 234 T2D patients, from the Diabetes Clinic at SQUH, were interviewed and questioned about their FH of T2D. The personal history of T2D among patients was confirmed from the diagnosis and medical history deposited in the electronic records of the hospital information system. Exclusion criteria included: patients diagnosed with type 1 diabetes; maturity onset diabetes of the young (MODY); positive diabetic antibodies (islet cell antibodies and glutamic acid decarboxylase antibodies); pregnancy induced diabetes or patients diagnosed with any type of cancer. Participants were informed about the project and written consents were obtained. The study was approved by the Ethics and Research Committee of the College of Medicine, Sultan Qaboos University. In order to determine family history of T2D, participants filled a questionnaire about their FH of T2D, which included their father, mother, brothers, sisters, aunts, uncles and grandparents. Father, mother, brother and sister were considered as first degree relatives. While, aunts and uncles were considered as second degree relatives. Most of the participants were not sure about their grandparent's status of diabetes, so that was excluded from the analysis. Anthropometric and biochemical parameters including height (m) and weight (kg) with indoor clothes and without shoes were measured for T2D patients and body mass index (BMI) was calculated. The patients were asked to fast overnight and their fasting blood glucose was measured. 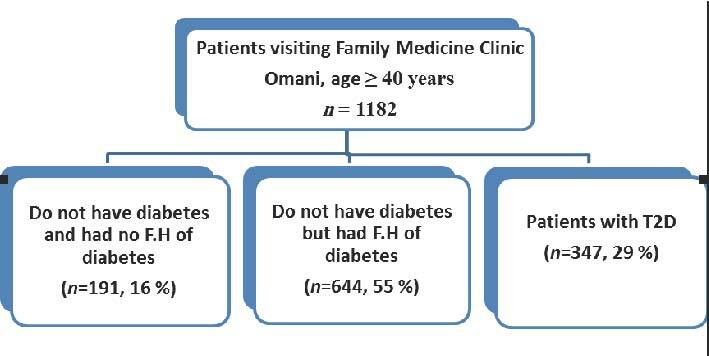 Figure 1: Distribution of Omani individuals according to their FH of diabetes. 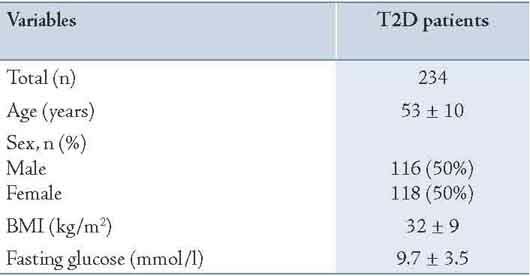 Table 1: Characteristics of Omani patients with T2D. 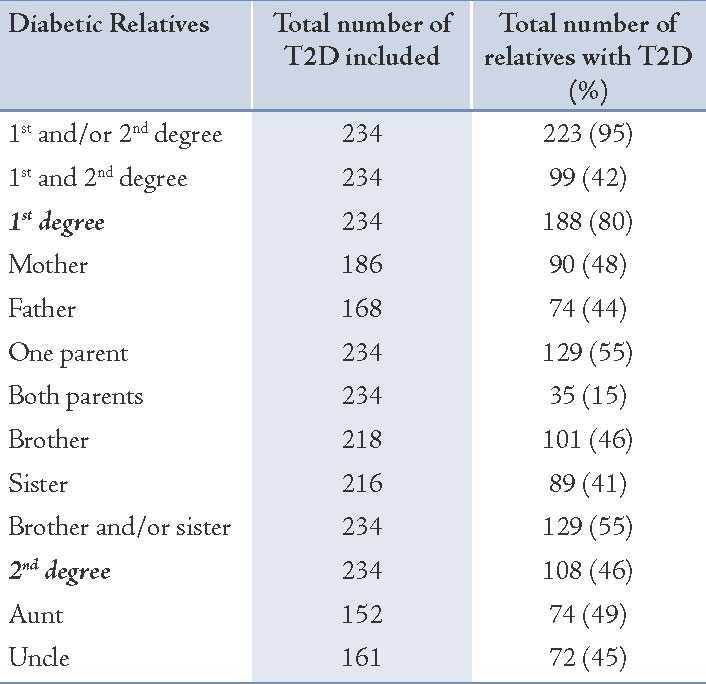 Table 2: Pattern of familial aggregation of T2D among a random cohort of 234 Omani patients with T2D. Figure 2: Pattern of familial aggregation of T2D among a random cohort of Omani patients with T2D. This study screened a random cohort of Omani individuals for FH of T2D and investigated the familial aggregation of the disease among another cohort of Omani patients with T2D. Only 16% of a random cohort of Omani individuals had no diabetes and no FH of diabetes. The remaining individuals were either diabetics or had a FH of diabetes. In addition, 95% of another random cohort of Omani patients with T2D had a FH of diabetes (either first or second degree). Eighty percent had first degree relatives with diabetes and 46% had second degree relatives with diabetes. At least one parent with diabetes was reported among 55% of diabetics. Maternal diabetes (55%) was found to be higher than paternal diabetes (47%). However, only 15% had both parents with diabetes. Furthermore, almost half of these diabetics were having at least one of the following relatives with diabetes: brother, sister, aunt or an uncle. Few studies were conducted among Arabs to investigate the family clustering of diabetes, despite high consanguineous marriages. Previous studies among Moroccans and Tunisians indicated familial aggregation of T2D, but the figures were much lower than those observed among the Omani population.10,26 However, the prevalence of T2D among Moroccans was also reported to be much lower than among the Omani population. A recent study in Qatar revealed that 73% of the subjects with DM had a positive FH of diabetes.28 However, that study examined a mixed sample of Qatari and other Arab populations, which possibly influenced the degree of familial aggregation. Almost everyone in Oman has a FH of diabetes. In addition, some dramatic changes in lifestyle and diet of Omanis have taken place in the past 25 years. If this high genetic predisposition is further compounded by lifestyle changes, then T2D may soon escalate into an epidemic among Omanis. Therefore, stringent screening programs among the Omani families should be adopted to protect this Arab population from the adverse effects of developing diabetes and its complications. Consanguineous marriages are part of Omani Arab tradition, and cannot be changed fast-enough; although, nowadays it has been noticeably reduced. The Ministry of Health in Oman has established a nationwide screening program to detect pre-diabetes among middle aged people (age ≥40 years).30 However, further health education programs and strategies should be adopted for children at schools to prevent this disease developing into an epidemic. Only 16% of the Omani individuals had no diabetes and no FH of diabetes. Omani individuals are prone to develop diabetes in the future because of their strong genetic predisposition and recent changes in lifestyle. This project was funded by the Research Council (TRC), Muscat, Oman (RC/MED/BIOC/10/01). We are grateful to the Deanship of postgraduate studies at Sultan Qaboos University, Muscat, Oman for the PhD grant to SS. We thank Nassra Al Maani and Ranjitha K. Sukumaran for their contribution in collection of patient's data. We also thank George Khaukha and Taruna Dutt for their support. We are grateful to the staff of the Diabetes and FAMCO clinics at SQUH for their help and support. We are indebted to all subjects who participated in this study. The authors have no competing interests to declare. 1. Shaw JE, Sicree RA, Zimmet PZ. Global estimates of the prevalence of diabetes for 2010 and 2030. Diabetes Res Clin Pract 2010 Jan;87(1):4-14. 2. Pierce M, Keen H, Bradley C. Risk of diabetes in offspring of parents with non-insulin-dependent diabetes. Diabet Med 1995 Jan;12(1):6-13. 3. Gloyn AL, McCarthy MI. The genetics of type 2 diabetes. Best Pract Res Clin Endocrinol Metab 2001 Sep;15(3):293-308. 4. Weires MB, Tausch B, Haug PJ, Edwards CQ, Wetter T, Cannon-Albright LA. Familiality of diabetes mellitus. Exp Clin Endocrinol Diabetes 2007 Nov;115(10):634-640. 5. Groop LC, Tuomi T. Non-insulin-dependent diabetes mellitus–a collision between thrifty genes and an affluent society. Ann Med 1997 Feb;29(1):37-53. 6. Ahlqvist E, Ahluwalia TS, Groop L. Genetics of type 2 diabetes. Clin Chem 2011 Feb;57(2):241-254. 7. Schäfer SA, Machicao F, Fritsche A, Häring HU, Kantartzis K. New type 2 diabetes risk genes provide new insights in insulin secretion mechanisms. Diabetes Res Clin Pract 2011 Aug;93(Suppl 1):S9-S24. 8. Lee SC, Pu YB, Chow CC, Yeung VT, Ko GT, So WY, et al. Diabetes in Hong Kong Chinese: evidence for familial clustering and parental effects. Diabetes Care 2000 Sep;23(9):1365-1368. 9. Klein BE, Klein R, Moss SE, Cruickshanks KJ. Parental history of diabetes in a population-based study. Diabetes Care 1996 Aug;19(8):827-830. 10. Arfa I, Abid A, Malouche D, Ben Alaya N, Azegue TR, Mannai I, et al. Familial aggregation and excess maternal transmission of type 2 diabetes in Tunisia. Postgrad Med J 2007 May;83(979):348-351. 11. Papazafiropoulou A, Sotiropoulos A, Skliros E, Kardara M, Kokolaki A, Apostolou O, et al. Familial history of diabetes and clinical characteristics in Greek subjects with type 2 diabetes. BMC Endocr Disord 2009;9(9):12. 12. Thomas F, Balkau B, Vauzelle-Kervroedan F, Papoz L, Soussan DB, Cuny P, et al; CODIAB-INSERM-ZENECA Study Group. Maternal effect and familial aggregation in NIDDM. The CODIAB Study. Diabetes 1994 Jan;43(1):63-67. 13. Erasmus RT, Blanco Blanco E, Okesina AB, Mesa Arana J, Gqweta Z, Matsha T. Importance of family history in type 2 black South African diabetic patients. Postgrad Med J 2001 May;77(907):323-325. 14. Alcolado JC, Alcolado R. Importance of maternal history of non-insulin dependent diabetic patients. BMJ 1991 May;302(6786):1178-1180. 15. Bo S, Cavallo-Perin P, Gentile L, Repetti E, Pagano G. Influence of a familial history of diabetes on the clinical characteristics of patients with Type 2 diabetes mellitus. Diabet Med 2000 Jul;17(7):538-542. 16. Crispim D, Canani LH, Gross JL, Tschiedel B, Souto KE, Roisenberg I. Familial history of type 2 diabetes in patients from Southern Brazil and its influence on the clinical characteristics of this disease. Arq Bras Endocrinol Metabol 2006 Oct;50(5):862-868. 17. Viswanathan M, McCarthy MI, Snehalatha C, Hitman GA, Ramachandran A. Familial aggregation of type 2 (non-insulin-dependent) diabetes mellitus in south India; absence of excess maternal transmission. Diabet Med 1996 Mar;13(3):232-237. 18. Mitchell BD, Kammerer CM, Reinhart LJ, Stern MP, MacCluer JW. Is there an excess in maternal transmission of NIDDM? Diabetologia 1995 Mar;38(3):314-317. 19. Kim DJ, Cho NH, Noh JH, Lee MS, Lee MK, Kim KW. Lack of excess maternal transmission of type 2 diabetes in a Korean population. Diabetes Res Clin Pract 2004 Aug;65(2):117-124. 20. Meigs JB, Cupples LA, Wilson PW. Parental transmission of type 2 diabetes: the Framingham Offspring Study. Diabetes 2000 Dec;49(12):2201-2207. 21. Thorand B, Liese AD, Metzger MH, Reitmeir P, Schneider A, Löwel H. Can inaccuracy of reported parental history of diabetes explain the maternal transmission hypothesis for diabetes? Int J Epidemiol 2001 Oct;30(5):1084-1089. 22. IDF. IDF DIABETES ATLAS. International Diabetes Federation 2011; 5th Edition:http://www.idf.org/sites/default/files/5E_IDFAtlasPoster_2012_EN.pdf, 2012. 23. Islam MM. The Practice of Consanguineous Marriage in Oman: Prevalence, Trends and Determinants. Journal of biosocial science. 2012;9(1469-7599 (Electronic)):1-24. 25. Kato N. Insights into the genetic basis of type 2 diabetes. Journal of Diabetes Investigation. 2013;4(3):233-244 . 26. Benrahma H, Arfa I, Charif M, Bounaceur S, Eloualid A, Boulouiz R, et al. 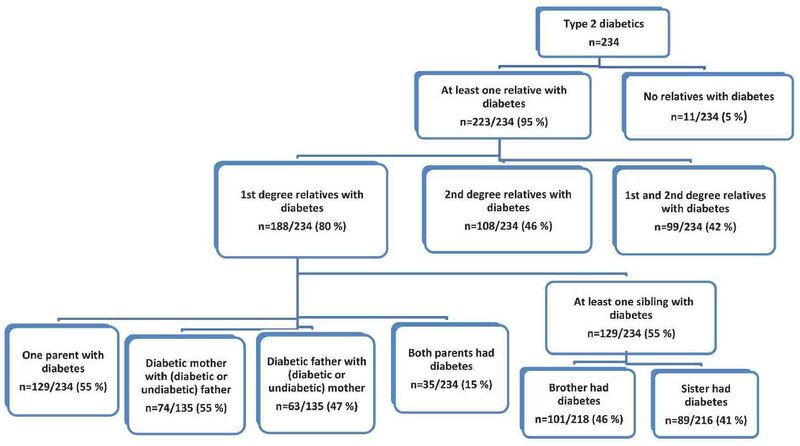 Maternal effect and familial aggregation in a type 2 diabetic Moroccan population. J Community Health 2011 Dec;36(6):943-948. 27. Cheţa D, Dumitrescu C, Georgescu M, Cocioabă G, Lichiardopol R, Stamoran M, et al. A study on the types of diabetes mellitus in first degree relatives of diabetic patients. Diabete Metab 1990 Jan-Feb;16(1):11-15. 28. Bener A, Yousafzai MT, Al-Hamaq AO, Mohammad AG, Defronzo RA. Parental transmission of type 2 diabetes mellitus in a highly endogamous population. World J Diabetes 2013 Apr;4(2):40-46. 29. De Silva SN, Weerasuriya N, De Alwis NM, De Silva MW, Fernando DJ. Excess maternal transmission and familial aggregation of Type 2 diabetes in Sri Lanka. Diabetes Res Clin Pract 2002 Dec;58(3):173-177. 30. Al-Shereiqi S. Non-communicable diseases screening: Starts in Oman. Community Health and Disease Surveillance newsletter. 2008;17(3):1.